Friday morning saw me in the ‘On Demand’ room. Let me explain. As a presenter you need to be clear speaking, happy before an audience and know your subject. The On Demand room is where we can preview the festival films, take notes and do our homework. Subject knowledge is imperative in speaking and being able to feed interesting facts or information to your audience makes such a difference to their experience. I opened the film ‘Trango’ at the festival last year. It starred Jerry Gore, an excellent climber from the UK, now based in the Ecrin. Jerry is Diabetic and manages his condition in extreme conditions on expeditions across the world. We had chatted on Skype many times and it was my pleasure to finally meet and open for him at the festival. He’s an excellent speaker and quite a character. We hope to climb together soon. Saturday was a manic day, but filled with highlights. One was to catch up again with Julie Summers. I wrote a blog recently after her stunning talk about her great uncle Sandy Irvine. Julie was hosting the Boardman Tasker Award for Mountain Literature, reviewing books and like many of us involved in the festival, running around at 100mph. Over dinner on Saturday evening we discussed many topics and she has kindly agreed to review ‘Once Bitten and ‘Seven Peaks – Seven Islands’. The day ended with the RAB party and I think my head hit the pillow around 3:00am. Working at Kendal should be marketed as an extreme endurance event due to sleep depravation, pizza, chips and pie intake and the amounts of beer drunk. Climbing in the Alps is much easier! In the Base Camp tent I was asked if I had travelled much and what mountain qualifications I had. I was handed a form to fill in and thought for a moment. The answers couldn’t have been further apart. The box for travels was far too small and in the qualifications box I just wrote on word – Mad! Same time next year folks..? 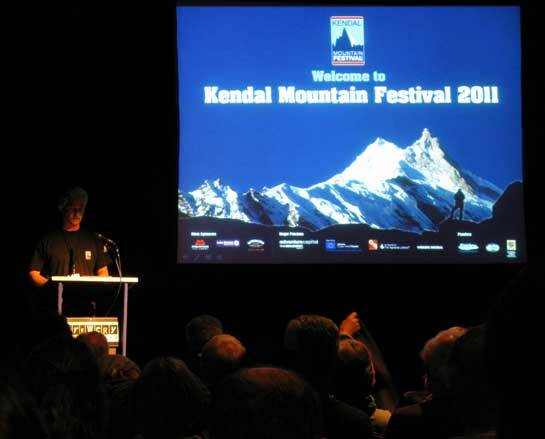 Kendal Mountain Festival is a 4 day event with a footfall of over 8000 visitors. We require our presenters to be knowledgable on mountains and mountaineers, personable, clear, and above all enthusiatic. They need to feel comfortable speaking concisely for a 3 to 5 minute period to introduce both films and live speakers in venues that range from an intimate 30 seater studio to a 500 seater theatre. They also need to be flexible and deal with last minute changes and problems that inevitably arise in a Festival environment. Nigel Vardy ticks all those boxes, adapting his style and content to suit both subject and audience. Above all, his ability to enthuse shines through with his passion and personality. I’m delighted to have Nigel on the Kendal team, and look forward to working with him in future. Sounds like you had a blast! Thanks for the summary highlights.